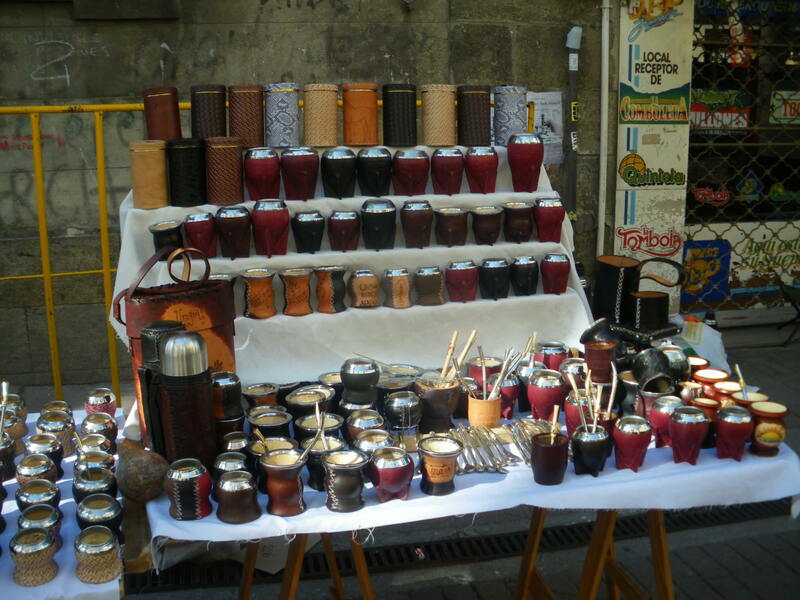 A Typical selection of Mate cups in Montevideo, URUGUAY – today’s Thirsty Thursdays! Before I go on, I fell in love with Uruguay. It’s by far one of my favourite countries and things just seemed perfect there. A relaxing place, decent beaches, great cities that aren’t too big, cheap beer and food, great bus travel, friendly people and their obsession with Mate!!! Today’s Thirsty Thursdays takes me back to Montevideo in Uruguay where I first tried Mate, the national obsession. Yes this is a Uruguayan thing, it really is. You do see them in Argentina, but to get the best Mate tea and witness the Mate phenomenon you need to head to Montevideo. In short – it’s a hot herbal tea that is a national obsession in Uruguay (*and Argentina and Paraguay). If you want to know about the process of how it’s made etc. then I assume it gets grown, harvested, dried then sold. 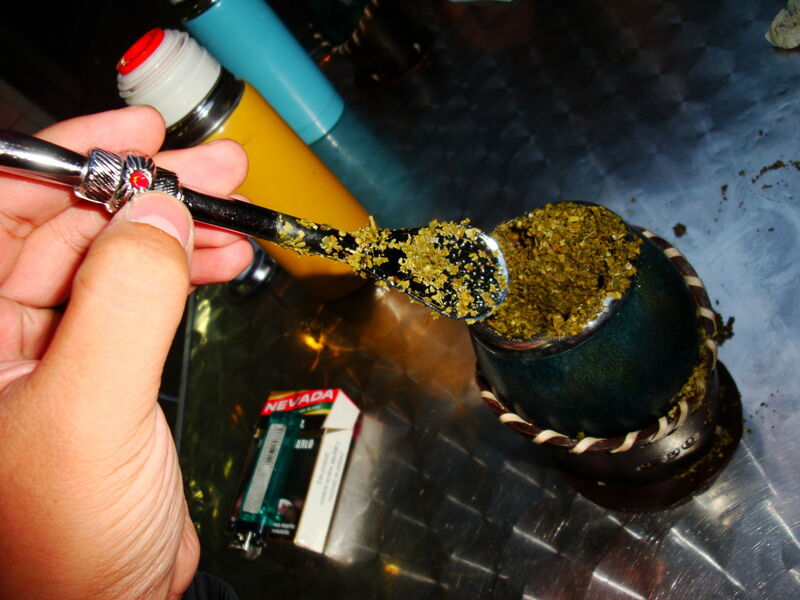 All the Mate I tried in Uruguay was green in colour. It’s like green tea leaves and it has a very distinct taste. Where can you try Mate Tea in Uruguay? 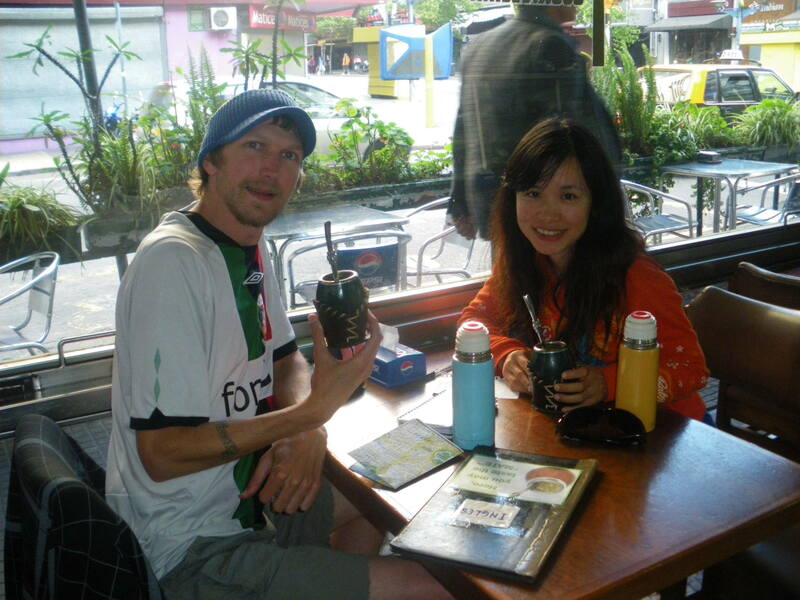 Believe it or not, as a tourist it is quite difficult to come by in restaurants in Montevideo. Most restaurants don’t serve it, but luckily I’m here to break the mould and tell you how to find it! Myself and my girlfriend trying Mate tea in the Manchester Bar in Montevideo – became a bit of a regular as I was studying Spanish nearby! 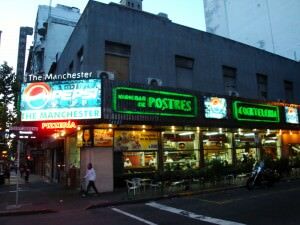 The Manchester Bar on Avenida 18 de Julio (it’s on a prominent corner on the main road, just a few blocks up from Plaza Independencia). The Manchester Bar in central Montevideo – serves decent Mate Tea! Short answer: Dos de Mate por favor. Two Mates please. Long answer: Once you’re inside the Manchester Bar (or another bar that serves Mate tea) just ask for 2 small ones. It cost me 60 Uruguayan Pesos each back in 2010 and inflation in Montevideo ain’t that high, so expect to pay less than 70 Pesos at the moment. 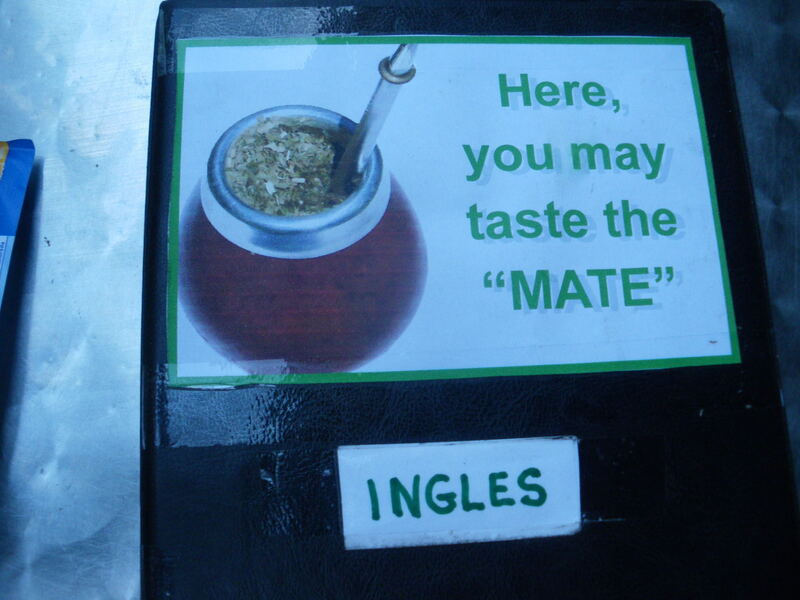 What do you get when you order Mate Tea in Uruguay? What is Mate tea in Uruguay like? I LOVED it. I’m big into my teas though and rarely find on I don’t enjoy. Mate is really relaxing, healthy and stimulating. 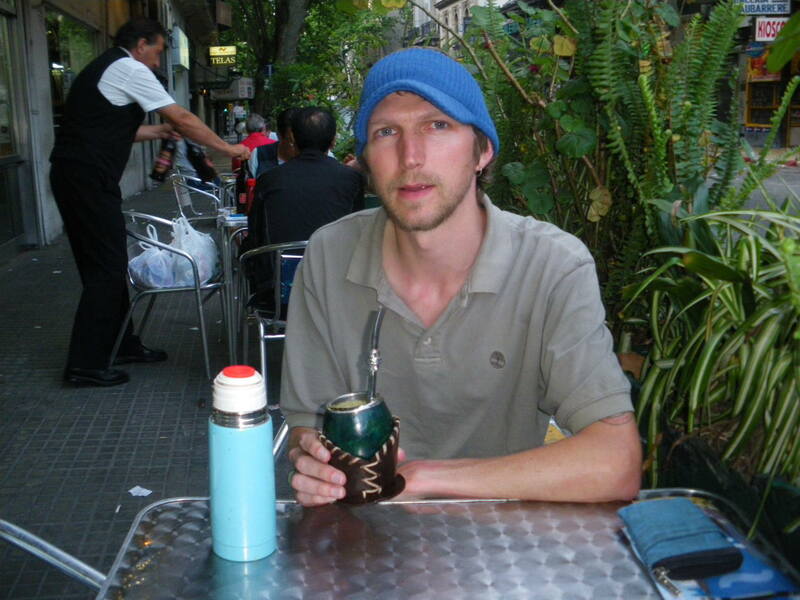 In fact it helped me study Spanish and keep my travel blog up to date at the same time while I was in Uruguay in 2010. I miss it and I’d love a Mate tea now. Thirsty Thursdays is an ongoing regular feature on Don’t Stop Living – a lifestyle of travel. If you have a bar, pub, drink, restaurant, brand or idea that you would like featured on Thirsty Thursdays, please get in touch via my contacts page or my advertising page. I’d love to hear from you, and I’d also love a free tea or a beer! Cheers! 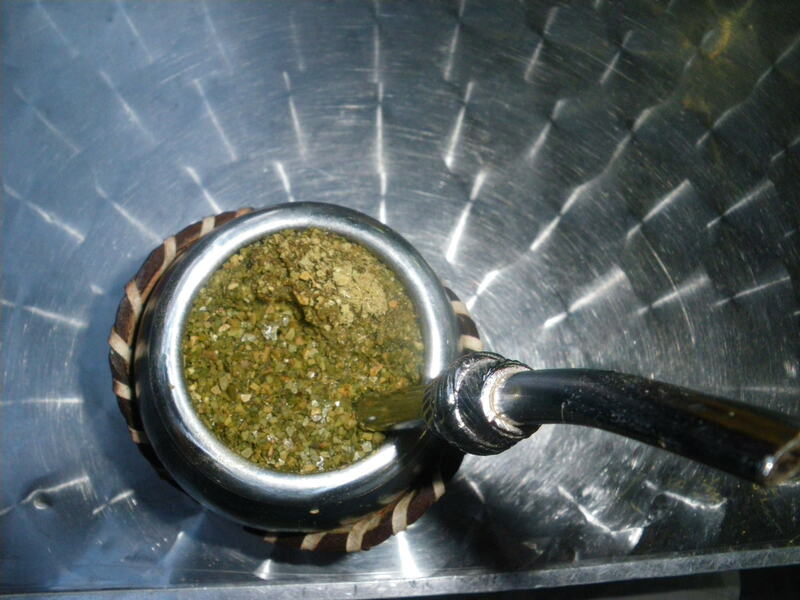 Try the Mate Tea in Montevideo – top drink! 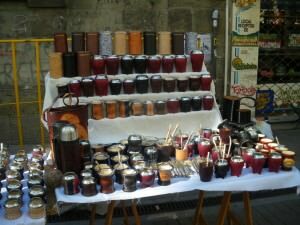 This entry was posted in Daily Features, Destinations, Montevideo, South America, Thirsty Thursdays, Uruguay. Bookmark the permalink. ← Working Wednesdays: How to Keep a Travel Blog Updated When You Travel All The Time!